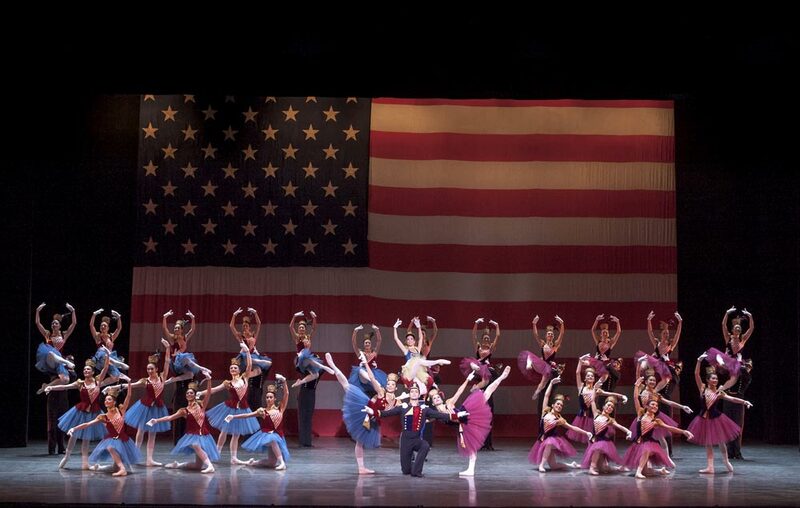 Ballet San Jose in Stars and Stripes – The Fifth Campaign. For the last several years Ballet San Jose has been traveling a rocky road. The company began as the Cleveland Ballet, founded in 1974 by Dennis Nahat and the late Ian Horvath. Then in 1986 it morphed into San Jose Cleveland Ballet, splitting its seasons and audiences between the Midwest and California. In 2000 the Cleveland part of the equation evaporated and the remaining company became the Ballet San Jose SIlicon Valley still under Nahat’s direction. This spring Nahat was forced out by the board of directors, a bit like Edward Villella at Miami City Ballet. The company now has no official artistic director and any leadership is provided by Artistic Advisor Wes Chapman (formerly a principal dancer at American Ballet Theatre, and after retiring from the stage, director of Ballet Alabama and then back to ABT as a Ballet Master and director of the junior ABT company), and Raymond Rodriguez, Principal Ballet Master. Saturday night at the Center for the Performing Arts, Ballet San Jose took to the stage in a Gala Performance to raise money to cover the costs of providing live music for all upcoming performances in the 2012-2013 season, an ambitious goal for a regional company in times when donations are not flowing as freely as they once were, despite its close proximity to one of the wealthiest spots in the world, the technology ghetto – Silicon Valley. Rudy Candia and Alexsandra Meijer in Meditation from Thais. Like most galas, this one is a potpourri of every style imaginable. I am a bit surprised that the performance opens with the Symphony Silicon Valley under the baton of maestro George Daugherty playing the “Star-Spangled Banner”, perhaps more appropriate to a sporting event, but given that the presidential election is just days away it’s a patriotic reminder to vote and a perfect tie-in to Balanchine’s Stars and Stripes that will close the first half of the evening. On to the dancing with Waltz of the Flowers fromThe Nutcracker. The choreography is by Karen Gabay, a principal dancer with the company whose version of this holiday staple will be premiering in its entirety next month. The dancers are fine, but the constant entrances and exits prevent this piece from coalescing, and it ends up looking like an assortment of steps strung together without any logical sense. I will confess to being an Ashton fan and am happy to see that the Meditation from Thais is the next morsel up for tasting. At least Alexsandra Meijer makes up in technical assurance and fluidity for the missing poetry so essential to this vision in the desert set to Massenet’s famous music. Though Rudy Candia could be more consistent in his partnering he is still a sympathetic presence on stage. Edward Stierle’s Lacrymosa -Solo Excerpt is clear evidence that his premature death more than twenty years ago at age twenty-three from AIDS is more than just the loss of a promising dancer. To the section of Mozart’s Requiem of the same name he provided some very interesting choreography that looks like he had his own voice. Joshua Seibel does an excellent job with the often-demanding sequences once he overcomes some initial hesitation. Nutnaree Pipit-Suksun and Jeremy Kovitch in Clear. Clear – Fifth Movement Adagio by Stanton Welch to the Largo from J.S. Bach’s Concerto for Violin in G minor lets us see just how much more Nutnaree Pipit-Suksun has to offer than she was ever allowed to do when she was a soloist with San Francisco Ballet. The unfortunate costuming with bellbottom pants obscures what hints to be some gorgeous lines she pulls out of nowhere with support from Jeremy Kovitch. Another glimpse toward the coming season is the Grand Pas de Deux from Don Quixote. BSJ will be mounting the entire ballet next February and hopefully the rest of the dancers will bring as much infectious spirit as Junna Ige and Maykel Solas do to this performance. Solas is an excellent partner and Ige wields her fan with a deft flick of the wrist and a dash of salsa caliente. Perhaps because the house is full of family and friends, the audience hit of the evening is Celebration Polonaise using the students of the Ballet San Jose School’s pre-professional division. I enjoy this demonstration using the the Polonaise from Tchaikovsky’s The Sleeping Beauty because from the smallest aspiring dancer to the more accomplished older students these young people show us the future of ballet. Despite our ever more-technologised world there are still some who will value and preserve this ephemeral art. 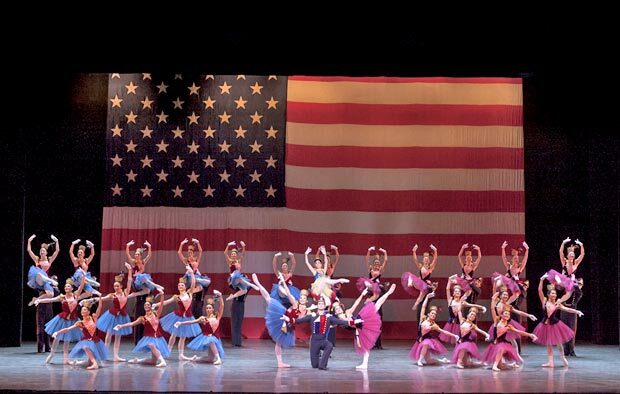 The whole company musters spit and polish in an engaging rendition of the Fifth Campaign from Balanchine’s Stars and Stripes. Maria Jacobs-Yu and Ramon Moreno couldn’t be more perfect as the leading couple. Junna Ige and Maykel Solas in Don Quixote. The best comes last – Bruch Violin Concerto No. 1 by Clark Tippet, another choreographer who died too young. The ballet seems fresh though created more than twenty-five years ago in 1987. Tippet clearly speaks his own language and I am continually surprised by how complex the choreography is, often going in unanticipated directions, and repeating motifs in new contexts. Ige and Solas are paired again as one of four lead couples, and definitely have chemistry. Meijer gives us a beautiful technical performance although she seems rather detached emotionally. Amy Marie Briones, recently promoted to soloist, is dazzling – in her turns, her élan and her radiant joy – and is my favorite dancer in this piece. SInce the purpose of the gala is to raise money for the music, I will mention that violinist Rachel Lee, who played the solo violin for Meditation from Thais, Clear, and Bruch Violin Concerto, does an admirable job and along with the entire orchestra proves once more just how rewarding live music is for both the audience and the dancers. Hopefully this is a new beginning for the beleaguered troupe, but without substantial changes to the administrative and artistic structures I’m not certain in which direction the company is headed. There is so much potential to be realised that it would be disappointing to see it ebb away.